But at the same time, I can’t shrug off the process. I love knitting, and I especially love knitting that isn’t boring. I need to reach for something that’s going to engage my mind in some way, even if it’s a repeating 2-row pattern or a ribbed sock that makes me stop and work heels and toes every so often. I like knitting that asks a little something of me. I mean, why else would I not only design a pattern with stabby twisty tiny cables for Kim’s Buffy the Vampire Slayer yarn, but then go on to knit the pattern not once, not twice, but three times? That’s definitely process and product working together. I love working the cables, but darn it all I want to show them off, too. Same delicious stake-through-the-heart cables as in the original pattern, just more of them to love. And they are toasty and comfy to wear. I’m glad I finally got around to sewing up the toes on these babies, because spring’s the perfect time to show off new socks – no longer buried under boots, but still cool enough to need the layer. No matter what you’re knitting on this weekend, I hope you enjoy both product and process! Happy Friday. 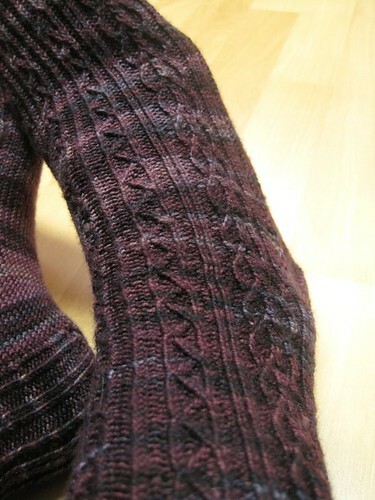 Beautiful sock, and great name for a yarn color, too. Does this mean that you’re a fairly monogamous knitter? Most knitters I know wouldn’t have any issue with starting a new project, even if the current one isn’t done yet! Me, I like to finish before I start a new one, or I’ll never come back…UFOs will multiply like tribbles and take over the house. Congrats on your sock pattern re-release! Oh, I’m definitely a multi-project knitter! Though if I get more than 3 or so on the needles at once, it does start to stress me out a bit and I feel the need to finish things. I always need at least 2 to go back and forth with! I was wondering… you mentioned in a post a few months back about how all the socks you own are handknit. 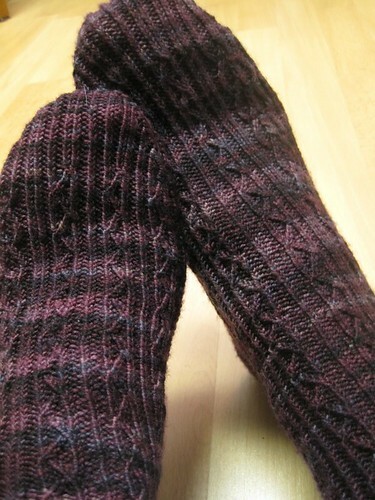 Do you run in your handknit socks, too? Good question! And that is in fact the exception – I use wicking running socks for running. The yarn color you used has the greatest name ever. These are definitely socks to show off in spring shoes. Love the colour Glenna..as a member of the Indigodragonfly club I love the names of the yarn. My hubby waits for me to open the package just to see what Kim has named the next installment. Great socks and they were a great knit. I don’t know when I changed – because I totally used to be a fussy-cables, fancy-twisted-stitches knitter. But as I knit more (and possibly as I get busier) I seem to get more drawn to endless swaths of garter stitch and plain things that I’ll want to wear often. I’m not sure what type of knitter I am. Maybe I could say I’m both. When I first started knitting (and crocheting), I pictured myself making all these things for people, and people flocking to me and asking me to make things for them. But then I came back to reality, and decided that if people want things, I will make things for them, but I am going to make things for myself and things that I would wear first and foremost. I think this is realistic, and also, cuts down on any disappointments! I love the process and the product. I do love the act, it relaxes me but then I love to show it off. Lovely yarn, great pattern I have a weakness for socks and fingerless mitts(not quite sure what that is all about yet). I’ll have to get my hands on that kit. I was just telling indigodragonfly that I plan to do a sock pattern and yarn review based on the last post she did (it should be up in a couple of days, but I’m behind). I love those socks but this product knitter does NOT have the patience for those!